One of the most famous and most visited natural wonders of the world, the Belogradchik rocks are almost 30 km length, 3 – 5 km wide and approximately 200 m high. The Belogradchik Rocks cover the western side of the Balkan Mountains and are spread over an area of 50 sq km. They stretch out from the Belotintsi village of in the east to the Rabisha village in the west. 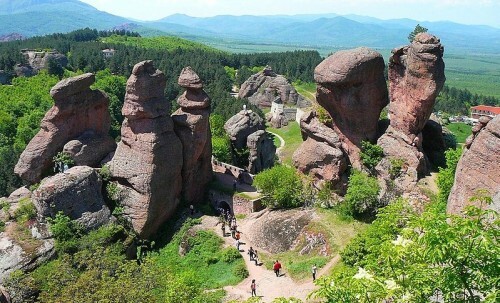 The most splendid rocks lie in the area surrounding Belogradchik. These include the Madonna, The Rider, The Monks, The Student, The Lion, The Bear, Adam and Eve. From the platform of the well-known Stone of Thought you can enjoy an uninterrupted view of peaks, precipices, rocks, green meadows, rippling streams and the tranquil lineaments of Old mountain. The vegetation around the Belogradchik rocks comprises a number of unusual species typically found in the Balkans and included in the Red book of Bulgaria. The animals are depicted by imperial eagle, small vulture, owl, wolf, black stork, wild boar, deer, royal slag, and dormouse. Towards the latter part of the Palaeozoic era this region used to be full of stratified sandy rocks. Afterward they were submerged under the sea waters, the underneath floor of which were full of sand, gravel and clay. With the passage of time these materials were united with sandy-clay solder. This way started to appear. The reddish color of the rocks is due to the presence of the iron oxides as well as hydroxides. Resulting from the New Alpine tectonic cycle, the area shrank and emerged above the surface and the region of Belogradchik went into a huge crevice. Due to the effects of winds, water and temperature changes the limestones from these areas got torn down, revealing the cracked conglomerates. Strangely enough, through the erosion occurred over millions of years, there were created naturally born nature’s masterpieces of art. Figures of mythological creatures, men and women, animals and birds were sculptured by nature from the shapeless stone. These rock columns form a natural fortress, which has been, from time and again exploited by intruders. Every rock of the Belogradchik Rocks has a tale to tell. There used to be a monastery in this spot and there was a nun with unparalleled beauty in the monastery. Although she was told by Mother Superior to keep her face hidden under the cassock, the nun’s beauty managed to draw the attention and love of a young patrician during the festivals of Petrovden celebration. Their affair, secret and clandestine, continued for a long time until the birth of their child raised suspicion and then confirmed the relationship. As a result she was to be punished by the nuns and they expelled her along with her child out of the priory. As the nun was moving out of the monastery gates, the rocks opened up, the monastery and the nunnery were drawn underground and everything around, including the nuns, monks, the beautiful nun, her lover, riding to his beloved on a white horse and their child were miraculously turned to stone. A collection of peculiarly shaped rock formations of sandstone, limestone and conglomerates the Belogradchik Rocks are found on the western side of the Balkan Mountains close to the Belogradchik town in northwestern parts of Bulgaria. The rocks are of varied colors chiefly ranging from red to yellow to gray. Some of these rock formations rise up to a height of 200 meters. Several of them representing various known figures form the mythology, they have been named after people or things they are believed to resemble. Declared a Natural Landmark by the Bulgarian government, the Belogradchik Rocks are one of the central tourist attractions of Bulgaria. 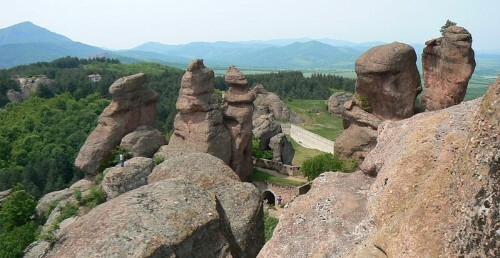 The central cluster of rocks can be found to the south and next to the town of Belogradchik. Here you can see the most impressive rock formations – Adam and Eve, the Mushrooms, the Dervish, the Schoolgirl, the Shepherd Boy, the Bear, the Camel, the Lion, the Madonna, the Monks, the Horseman, the goddess Bendida, the Rebel Velko, and many more. 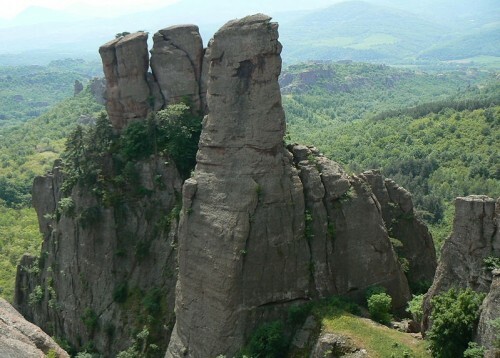 The second cluster of rocks is found on the west of Belogradchik town. The rocks of Alpine variety surrounded by steep precipices include stone figures of Zbegovete, Erqupriya, and Boritch. The third cluster of rocks is situated 4 km. to the east of Belogradchik town. The fourth cluster of rocks is found stuck between the villages of Falkovets and Borovitsa. These rock formations include figures of the Pine Stone, the Torlak, the Bee Stone, and the Maid’s Rock. The fifth cluster of rocks can be found between the villages of Belotintsi and Gyurgich. You can avail of the regular bus services operating from Vidin to Belogradchik. The bus stop in Belogradchik is situated right beside the main street. Avail of the line Sofia – Oreshets, which allows you to choose from a number of trains that leave from the Sofia Central Station and the reach Oreshets station which is a small village 10 km away of Belogradchik.